Successfully Added Android TV Box Sunvell T95Z Plus - Dual-Band WiFi, Google Play, 4K Resolution, Kodi TV, Octa-Core CPU, 3GB RAM, 32GB Storage to your Shopping Cart. With the 32GB version of the Sunvell T95Z Plus Android TV Box, you’ll be able to turn your regular TV into a smart TV that comes along with an abundance of high-end mobile entertainment features. 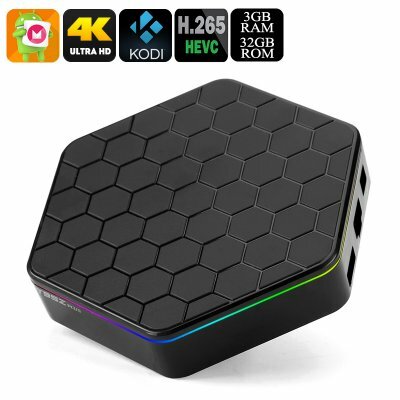 Running on an Android 6.0 operating system, this TV box allows you to browse the web, play games, enjoy mobile applications, and watch movies in absolutely stunning 4K resolution. Providing you with a media experience like never before, this 4K TV box truly lets you enjoy a cinematic experience from the comfort of your own living room. Make yourself some popcorn, sit back, and relax. With the Sunvell T95Z Plus TV box, you’ll never have to feel bored again. Supporting both Google Play and Kodi TV, this 4K TV Box provides you with access to an unlimited pool of games, applications, and movies. Whether you’d like to invite over your friends to enjoy an evening filled with games, or simply like to sit back with your family and enjoy a relaxing movie – this Android 6.0 TV box is guaranteed to meet all your demands. With 32GB of internal storage and a 32GB SD card slot, this 4K TV box packs all the memory you need to save all your favorite media and files alike. Within its stylish body, this Android TV box packs a powerful Octa-Core CPU as well as 3GB of RAM that guarantees to bring along a powerful performance. Additionally, it comes with the ARM Mali -T820MP3 graphics unit – providing you with stunning detail and vivid color while enjoying your favorite movies and graphically demanding Android games. Along with its 4K support, this Android TV box truly takes your media experience to entirely new heights. Dual-Band WiFi connectivity allows this 4K TV box to browse the web, stream online movies, and download files in the blink of an eye. No longer will you be interrupted by any lag or a slow internet connection while playing online – letting you take the most out of your online media experience. With its Android 6.0 operating system, it is guaranteed to bring along a smooth user experience while its 4K support and powerful hardware let you enjoy stunning visuals at any time – making it the ultimate smart TV accessory that’s fit for any modern household out there. The Sunvell T95Z Plus Android TV Box comes with a 12 months warranty, brought to you by the leader in electronic devices as well as wholesale electronic gadgets..